In this applied finance course, you'll learn how to use R to develop a model to value a fixed interest rate bond, estimate and analyze a bond's yield, and much more! This week we are launching Bond Valuation and Analysis in R taught by Clifford S. Ang, CFA, Vice President at Compass Lexecon. Bonds are securities issued by governments or corporations that pay interest over a fixed schedule and are the most well-known type of fixed income securities. The US fixed income market is 1.5x larger than the US stock market, but, unlike stocks, most fixed income instruments, including bonds, trade very infrequently. Consequently, a bond's price may be a less reliable indicator of its value and analytical techniques are necessary when analyzing and valuing bonds. After this course, you will be able to use R to develop a model to value a fixed interest rate bond, estimate and analyze a bond's yield (i.e., a measure of the opportunity cost of bond investors), and model techniques used to protect bond portfolios from changes in interest rates. 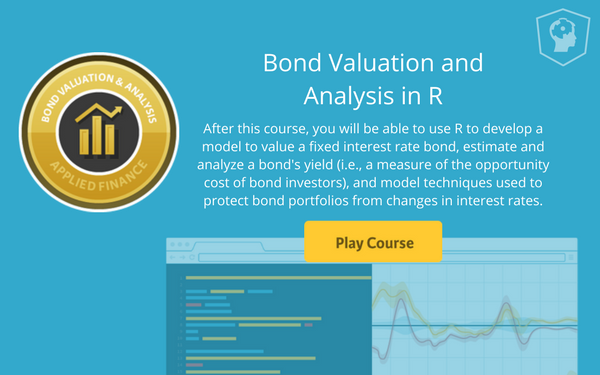 Bond Valuation and Analysis in R features 43 interactive exercises that combine high-quality video, in-browser coding, and gamification for an engaging learning experience that will get you on your way to becoming a bond valuation expert! In the first chapter, Clifford will demonstrate the mechanics of valuing bonds by focusing on an annual coupon, fixed rate, fixed maturity, and option-free bond. Next, you will discover how to estimate the year-to-maturity of a bond. The YTM measures the expected return to bond investors if they hold the bond until maturity. In the third chapter, we start the discussion with a simple measure of bond price volatility - the Price Value of a Basis Point. The course will conclude by walking you through a comprehensive example. You will be asked to value a bond by using the yield on a comparable bond and estimate the bond's duration and convexity. Want to get started today?